Photo: Copyright © 2009, The Gombach Group. The York County Courthouse is located at 45 North George Street, York PA 17401; phone: 717-771-9614. Railroad Resources of York County Pennsylvania, a National Register of Historic Places "Multiple Property Resource," listed 1995. Formed August 9, 1749; named for the House of York, England. An agricultural region of great fertility. First authorized settlements were made in 1733. Before the white settlers came, the territory west of the Susquehanna River was hunting ground for the Conestoga Indians, a branch of the Mohawks, who migrated to New York State about 1750; also for the Susquehannocks and Conewagos, who had their village at present site of York Haven. When a treaty with the Indians at Albany, in 1736, gave Penn's heirs right to the territory from west of the Susquehanna to the South Mountain, immigrants from Europe flocked into York County, in vast numbers, and proved a strong and influential part of the population. During the colonial period four companies of soldiers from this county assisted in driving the French and Indians from the western part of the province before 1758. At beginning of the Revolutionary War it is said that the first military company from Pennsylvania that arrived at Washington's headquarters, siege of Boston, in 1775, shortly after Battle of Bunker Hill, were from York County; this company, and one commanded by Captain Morgan of Virginia, were first American troops to use rifles; they became the terror of the British regulars, who still used the old-time flint musket. When the British attacked New York City and the Battle of Long Island followed, Pennsylvania troops camped at Perth Amboy; here two regiments from York County were formed out of the militia; and became a part of the Flying Camp, a body of ten thousand men from Pennsylvania, Virginia, and Maryland, which joined Washington before the Battle of White Plains; they were also in the battles of Princeton and Trenton. Colonel Thomas Hartley, a member of York County bar, commanded a brigade under Washington at battles of Brandywine and Germantown; and after the Revolution he represented York County in Congress for twelve years; he was first member of the Pennsylvania bar to be admitted to the Supreme Court of the United States. President Washington was entertained in his house in 1791, site marked by tablet. Created on August 19, 1749, from part of Lancaster County and named either for the Duke of York, an early patron of the Penn family, or for the city and shire of York in England. The name may have been suggested by the proximity to Lancaster County, as the names are used together often in English history. York, the county seat, was laid out in 1741 and incorporated as a borough on September 24, 1787. It was chartered as a city on January 11, 1887. Pennsylvania's 1736 purchase from the Iroquois encompassed this area. The town of York was termed "Yorktown" in the colonial period. Cresap's War showed Maryland's desire to have the area, but it was yielded in 1760, and the matter finalized by the Mason-Dixon Line. 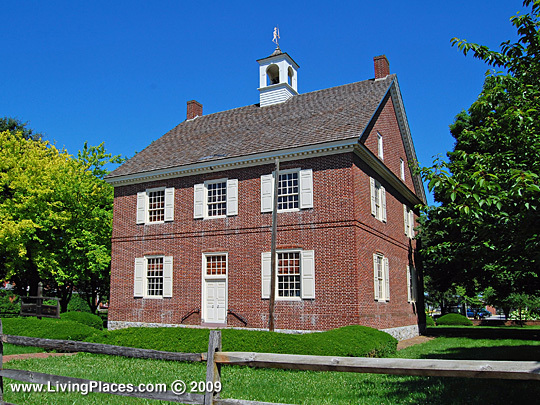 York was the capital of the U.S. from September 1777 to June 1778, where the Articles of Confederation were adopted. Agriculturally abundant from the start, York was very productive in corn, wheat, hemp, and whiskey. There was a canal from York to the Susquehanna in 1833. Five railroads served the county, and in the 1920s the Lincoln Highway boosted truck transportation. Products could be sold in both the Philadelphia and Baltimore markets and, later on, Pittsburgh as well. Early iron manufacturing did not lead to steel making but spawned metal products specialties such as farm implements that are still productive. Cigar making was a leading business until the 1930s. Wagon-making led to truck, auto, and railroad car manufacture. Building water wheels led to making turbines. Paper-making began early, followed by a printing industry. Ice cutting spawned refrigeration and air conditioners. Confections, safe vaults, barbells, quarried slate, chains, organs and pianos, rope, and silk were produced. Inventors and innovators gravitated toward York. High-speed steel, metal building panels and the Jeep were conceived here. The "York Plan" was a World War II system for cooperation to mobilize small industry to win the war; it was replayed for the Korean War. Deindustrialization has been less severe than other Pennsylvania industrial counties, although local ownership dropped. York is the sixth Pennsylvania county in value added to the economy from manufactures. Farms cover 48 percent of the land. Long the second most productive farm county (behind Lancaster), it is now seventh. About half the county is farmed; York is second only to Lancaster in number of farms. It is the leader in wheat and soybeans, and strong in corn, hogs, cattle, fruit and sheep.